Lots of driving, mostly on excellent asphalt and four stops where the expectations regarding plants were met. S3180 was an ad-hoc stop, because we needed to stretch our legs and provided most of the cacti that you might expect to find anywhere in Coahuila. SatNav tells me that we were near General Cepada. Plants photographed, in the order that the pictures were taken include Echinocactus horizonthalonius, Agave lechuguilla, Fouqueria splendens, Thelocactus bicolor and its subsp. bolaensis (so much for the rule that a species and its subspecies are not supposed to grow together), Lophophora williamsii, Opuntia rufida, Echinocereus stramineus, Corynopuntia sp., Mammillaria heyderi, Coryphantha sp (probably more than one – Ian has names) Astrophytum capricorne, and Epithelantha micromeris or one of its many names, real or imagined. Not a bad start for an unplanned Coahuila stop, but not completely unexpected. For S3181 we turned off Mex 40 at Estacion Marte, having pulled towards it by a table mountain called El Pillar. I had been here before in 2010 when some Mexicans were processing Agave leaves by turning them through a ‘mill’ to obtain pulp and fibre. This time the equipment was still there, but not in use. We crossed the railway before a long train with a variety of freight wagons passed through. Another 2 km past the village, the track offered access to a vast area of dried mud flats where in the past (Spring time) we had found Ariocarpus kotschoubeyanus and an assortment of other cacti struggling for survival. 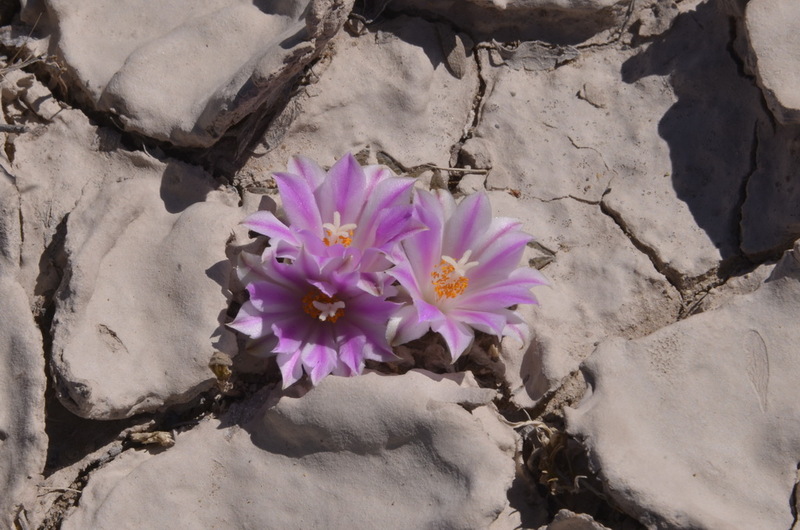 This was supposed to be their flowering time and we were not disappointed, but instead of the 100 % mass flowering that I had hoped for, this was a rather modest show by those plants, covered in dried up silt that had managed to push their flowers through the mud. Some of these had their flowers eaten by (we presume) a beetle that was seen marching around, leaving flower remains near the plants. I set myself the challenge of taking a picture of a plant in flower, with a wide angle setting that also included the expanse of desert and El Pillar in the background. I might need the help of my son, Christiaan, and his CGI wizardry, to convey both my expectations and reality for future presentations. As we approached El Pillar, we drove along huge silt flats that were sure to contain huge numbers of A. kotschoubeyanus as well, but in true cactus tourist style we had driven straight passed these to our intended target. With our objective reached, we relaxed and made a random stop along the road that we had passed on Mex 40 to our turning to E. Marte and made a ‘quick’ ad-hoc stop, S3182. By the time that two cars have pulled over, released their passengers and equipment into the desert, get their bearings, take plenty of pictures before being shepherded back towards the car, at least an hour had passed – just to give you an impression of what a ‘quick stop’ means. Next a stiff drive at speeds between 100 and 120 kph to La Paloma where we turned into the desert to a spot where in the past we had found crested Ariocarpus retusus. Would the whole crest be in flower? We will never know. Many of the plants were still in advanced bud, some had today opened their flowers. The crest that Ian had found in March was looking unwell, the crests that Alain had found three weeks earlier were not seen. I asked Alain for the information, which he said he had given to Ian, I asked Ian, who said it was stored away on his computer. In any event, the plants were not found, until I read Ian’s report of the day. Fortunately I had found a number of crested retusus plants here before in 2010 when John Bleck showed me the plants that he had found. This time, and last March, we were distracted by a gate that had since been built to reach the exact spot where we had parked that time. 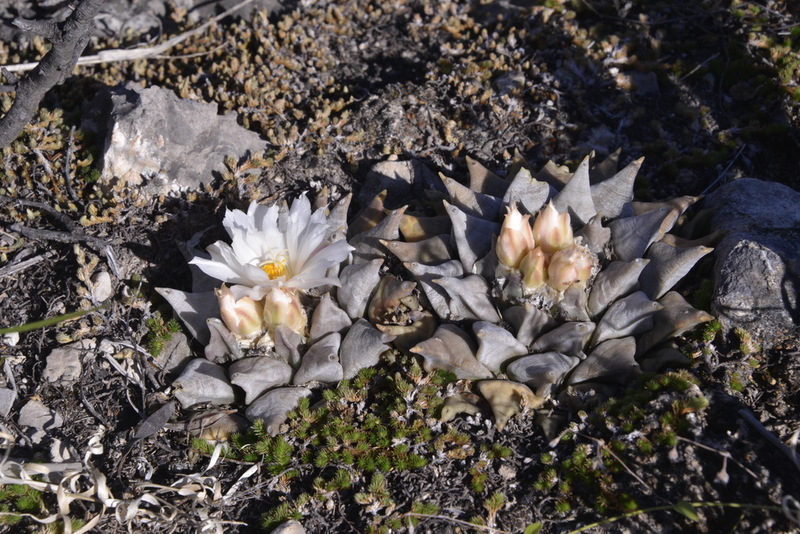 Ten minutes after continuing our journey to Cuatro Cienegas, Alain asked if we would see Ariocarpus agavoides. May be, but as I have seen it already …..
We’ll probably pass that way, and it would be churlish to avoid sharing past experiences with friends. Some 50 km south of Monclova, traffic suddenly came to a halt. Of course those in a hurry (most) just had to overtake, trucks, salloon cars and everything. The queue went as far as the eye could see. There was nothing coming the other way, just as well, as there was no way through for them. The usual characters, you get them all over the world, got out of their cars and marched purposefully towards the assumed couse of the hold up, but outside their air conditioned car soon found that the temperature rather soon ‘cooled’ their tempers. After some 45 minutes, traffic suddenly started moving our way – still nothing coming through from the north. It appeared that police had just closed the road and at a gravel track, sent us south east, towards MEX 53. We must have looked quite a convoy on Google Earth, if that had been life, a stream of cars several km. long throwing up lots of dust, moving through the desert at some 50 kph. When we hit MEX 53 we were still 47 km south of Monclova, so arrived in Cuatro Cienegas in the dark, but fortunately Restaurant El Doc stays open until 23:00 hrs, so we didn’t go hungry. Alain and Eunice had eaten here a few weeks earlier and Alain was able to recommend the rib-eye but warned against the T-bone, so four rib-eyes were ordered, but, disappointingly, four T-bones were served. Never mind.